Vintage Fringers, John D. Huston and Kenneth Brown, play everyone in two brilliant Sherlock Holmes adventures: Holmes, Watson, distressed damsels, perplexed police, scurrilous scoundrels. Seventy-five years of stagecraft on dazzling display in the world’s first, finest, sleuthing stories. Sixty scintillating minutes: Sherlock solves the mysteries, polished performers strut their stuff! The two gentlemen drew upon their experience to deliver snappy quick dialogue and constant action. 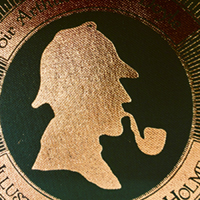 Despite multiple character shifts distinguished only by the hand off of a deerstalker I never had trouble discerning who was who and when, thanks to their physicality and distinct and consistent character voices. They would however benefit from slowing down, or at the very least articulating better, as sometimes I did miss dialogue, and they ran nearly ten minutes short, giving them the chance to take a breath. While I had admittedly already read one of the stories, I never found myself getting bored by the story, even though I knew the end. Funny and fast, the hour it takes certainly doesn’t seem like one. Outstanding! Two excellent actors amazingly in sync. Perfect timing and smooth exchanges, and well-played characterizations. Two classic Holmes & Watson stories played out quickly, sharply, and with an air of effortless that only excellent actors can affect. Will hold your attention and inspire a few guffaws.